This study focuses on how the entrepreneurs of budget hotels in Bali, Indonesia, manage entrepreneurship orientation to support marketing performance by proposing the variables of market sensing, organizational learning, and marketing resource flexibility. A total of 384 hotel managers were surveyed. By using Structural Equation Modeling (SEM) AMOS version 22, the findings show that entrepreneurial orientation mediated by market sensing can necessarily be applied in tourism-based SMEs. Moreover, marketing resource flexibility and organizational learning have significant influence on market sensing and marketing performance. The findings are actually useful in analyzing entrepreneur management in anticipating customer trends, particularly of the budget hotels in Bali that highly contribute to support the excellent performance and continuity of tourism of this region as the world’s most popular destination. Entrepreneurial Orientation, Organizational Learning, Marketing Resource Flexibility, Market Sensing, Marketing Performance. Many studies have revealed that entrepreneurial orientation influences company performance (Awang et al., 2010; Lyion et al., 2000; Wiklund and Sherperd, 2005). However, the mechanism of entrepreneurial orientation of SMEs affecting the performance revealed by previous literatures is still presumably inconclusive (Li, 2009). In this context, Rauch et al. (2009), Wiklund and Sherperd (2005) recommend the consideration to include mediating variables in the relationship between entrepreneurial orientation and marketing performance. Eriksson et al. (2014) suggest entrepreneurial orientation as an antecedent of organizational capability. Moreover, behavioral tendencies and the ability to innovatively act in the search and exploit for new opportunities more significantly affect performance. Accordingly, this study attempts to address the aforementioned gap and examine whether the concept of entrepreneurial orientation can particularly be applied to tourism-based SMEs, by selecting the object of budget hotels in Bali. 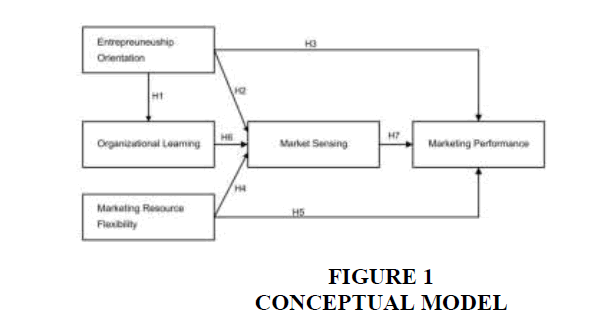 The focus of this study is on how the owners and managers of budget hotels manage the entrepreneurial orientation to support the marketing performance by proposing the variables of market sensing, organizational learning and marketing resource flexibility. Even though the roles of international chain hotels have widely empirically been discussed in previous literatures, this study would like to offer the originalityand enhance theoretical development of the role of entrepreneurial orientation of budget hotels on hospitality industry and international tourism; and the consideration of the characteristics of market sensing management of SMEs. In addition, the discussion of entrepreneurial orientation in tourism based-SMEs, and the role of market sensing in hospitality industry have not arguably sufficiently been discussed in the midst of rapid growing of tourism in an international context. Entrepreneurial orientation is of a very vital role in the acquisition and utilization of marketing information (Keh et al., 2007; Ismail, 2016). Rhee et al. (2010) argue that entrepreneurial orientation drives the learning orientation within organization. Companies with a high entrepreneurial orientation are more aggressively able to enter new markets characterized by a high risk and consequently, require more intensively organizational learning (Alegre and Chiva, 2009). Wang (2008) reveals that entrepreneurial orientation has a positive influence on organizational learning that ultimately positively influences marketing performance. The actions of entrepreneurial orientation are more likely to improve the ability of both management and employees’ level to capture new opportunities (Eriksson et al., 2014), obtain information of the changes potentially disrupting business (Rhee et al., 2010), manage risk (Gebauer, 2011; Wang et al., 2013) and strengthen any competitive advantage (Keh et al., 2007). Wiklund and Sherperd (2005) state that the combination of entrepreneurial orientation and the ability to anticipate environment dynamics and access to capital resource considerably influence marketing performance. Yang (2008) reveals that the types of transformational leadership and entrepreneurial orientation contribute to the achievement of a high marketing performance. Likewise, in analyzing the agribusiness industry in Malaysia, Awang et al. (2010) state that entrepreneurial orientation positively affects company performance. Eggers et al. (2013) find that customer orientation negatively influences performance, but entrepreneurial orientation has a positive effect. Grande et al. (2011) reveal a positive relationship between entrepreneurial orientation and marketing performance. H1: Entrepreneurial orientation positively influences organizational learning. H2: Entrepreneurial orientation positively affects market sensing. H3: Entrepreneurial orientation positively influences marketing performance. Resource flexibility is characterized by two forms of responsiveness of a high level of changes in supply and demand, and of adjusting of adaptive structure and marketing strategies to market changes (Kramarz and Kramarz, 2014). Flint et al. (2008) state that a company's ability in anticipating customer value comes from the success in environmental scanning. Sapienza et al. (2006) propose that the ability of adaptation and flexibility of resources can improve a company’s growth and survival strength. Chang et al. (2007) state that resource flexibility leads to the improvement of performance. Companies that have a flexible operational capability can optimize the utilization of resources and in turn, increase the performance (Gindy and Saad, 1998). Hence, an increasing level of the alternative use of resources shows the flexibility of particular company (Grande et al., 2011), in the form of volume, variations of the model and the number of new products launched (Esturilho and Estorilio, 2010). H4: Resource flexibility positively affects market sensing. H5: Marketing resource flexibility positively affects marketing performance. Unger and Homburg (2006), Levinthal (1991) state that knowledge, in the forms of adaptability and anticipation as a result of organizational learning, facilitates entrepreneurs to acquire new opportunities. Jantunen (2005) further states that the ability to anticipate any environmental changes is obtained from learning. This suggests that companies’ ability in exploring and scanning the business environment depends on the intensity of adequate learning (Rhee et al., 2010; Lopez et al., 2005; Wahyuni and Ginting, 2017). Hence, accumulated knowledge of learning is a useful element of knowledge in scanning the business environment. The fact that recently business competition heavily relies on the speed of information makes a company unable to mainly depend on the creation of internal knowledge, the intensity of adequate learning to build an absorbtive capacity of external knowledge required to enable companies to face competition and develop further capabilities (Cohen and Levinthal, 1990; Schienstock, 2009). Santos-Vijande et al. (2012) argue that organizational learning is more likely to improve company capability to capture more relevant information related to the current and future market trend. Hence, a higher organizational learning is likely to assist in the anticipation and adaptation actions of the company. The more intensive the organizational learning, the higher the ability of the organization to anticipate changes. H6: Organizational learning positively influences market sensing. Companies being able to anticipate the changing needs of customers tend to have superior performance (Flint et al., 2008; Blocker, 2007; Budiharseno, 2017). Hough and White (2004) mention a positive relationship between scanning frequency and the performance achieved by a company. Accordingly, a company is suggested to allocate resources which are adequate for scanning activity to monitor and evaluate both external and internal environment. Thomas et al. (1993) further state that scanning, interpretation and responsiveness positively affect performance. Johannesson and Palona (2010) find that scanning activity decisively determines the formulation of strategies and therefore affecting performance (Figure 1). H7: Market sensing positively influences marketing performance. This study uses representative sampling technique by distributing 384 questionnaires that were in accordance with the minimum sample requirement (Hair et al., 1998). A total of 384 copies of questionnaires were delivered to the enumerators for each district in Bali region. The response rate was 67% or 257 questionnaires were returned. As much as 45 questionnaires were not eligible, only the remaining data of 212 respondents were further processed. The data were further processed and analysed using Structural Equation Modeling (SEM) by software AMOS version 22. Before testing the hypotheses, the study conducted an analysis of the measurement model of exogenous and endogenous variables andstructural equation analysis to get a fit model that met the goodness index. The items for measuring the variable of entrepreneurial orientation were adopted from the concept developed from several previous studies (Covin and Slevin, 1989; Lumpkin and Dess, 1996) consisting of inovativeness, proactiveness, risk-taking and autonomy. The variable of market sensing is indicated by some activities, including scanning, sensing, classifying or framing, collecting, acquiring and integrating any information, potential resources and predictions of alternative actions and decisions, that are adapted from Celuch et al. (2007). Organizational learning was adapted from several previous studies (Wang, 2008; Nasution et al., 2011), consisting of commitment to actively understand and acquire new knowledge, techniques, methods and best practices in improving organizational performance. Moreover, marketing resource flexibility measurement items consist of utilization, allocation, reallocation and adoption of marketing resources immediately in response to changes in market demand (Ferdinand and Batu, 2013). Lastly, this study uses some measures of marketing performance including financial performance and the growth of employees (Lumpkin and Dess, 1996; Wiklund, 1999), comprising of three indicators, including the growth rate of sales, the growth rate of earnings and the growth rate of the company's assets. A majority of the respondents, 205 (96.7%) were owner-managers, whereas only 7 (3.3%) were managers. A total of 141 (66.5%) respondents were male, while 71 (33.5%) were female. A majority of the respondents (51.9%) were between 31 and 40 years old, followed by 40-50 years old (26.4%), and below 30 years old (15.1%). Of all the respondents, most graduated from high school (87.3%). Moreover, a total of 101 hotels (51.9%) were built between 2000- 2010, followed by those built between 1991-2000 (90 hotels or 42.5%), with a majority of them (189 hotels or 89.2%) were personally owned (Table 1). The validity was assessed from the confirmatory factor analysis explaining the significance and loading value of each indicator of a construct. Indicators are perceived to be meaningful if it has a loading value above 0.7 with a significance probability which does not exceed 0.05. The results of the analysis show that all the indicators have a significance of 0.01, meaning that all the indicators of constructs are able to reflect the latent variables. The result shows that the indicators of the exogenous variables have acceptable loading value: proactiveness (0.85), inovativeness (0.78) and risk (0.66) for entrepreneurial orientation, and allocation (0.89), utilization (0.87) and reallocation (0.86) for resource flexibility (Table 2). For endogenous variable, the validity and construct reliability results are shown in Table 3. Moreover, the testing results in an acceptable loading value of the indicators of the endogenous variables. The organizational learning indicators of intensively sharing new techniques and methods have the highest loading value (0.837), followed by accepting consumer suggestions (0.829) and searching new knowledge (0.824). The loading values of the variable of market sensing are acceptable: scanning competitor strategy (0.88), scanning business changes (0.835) and framing marketing information (0.825). Finally, all the indicators of market performance are significant at 0.01 with a loading value above 0.7, in which the rate of profit growth has the highest score (0.868), followed by the rate of sales growth (0.83), and asset growth (0.776). The test result in Chi-Square value (χ2) is 372.875 being relatively small compared with χ2 of Cut-off Value (CoV) which amounts to 386.125 at (0.05; 342). Hence, there is no difference between the model being tested with the saturated models (Table 4). The value of significance probability (α) is 0.12, greater than α of CoV of 0.05, therefore the matrix of variance/covariance is equal to the variance/covariance of sample. In addition, the test results meet the eligibility index of the model (GoF), such as GFI value (0.892), AGFI (0.872), Tucker Lewis Index (0.992), CFI (0.993), CMIN/DF (1.09 ≤ 2.00 that of CoV), RMSEA value (0.02 ≤ 0.08). Hence, it can be concluded that the model meets the criteria for a goodness of fit. Additionally, the test results reveal the explanatory ability that is reflected by the coefficient of determination or adjusted R-square, in which the entrepreneurial orientation, resource flexibility and organizational learning have relatively moderate predictability on customer value (0.33) and on marketing performance (0.32). The statistical testings of hypothesis one and two reveal a positive significant relationship between entrepreneurial orientation and organizational learning (β standardized=0.552; S.E=0.081; C.R=7.008; p-value=0.01); and between entreprenurial orientation and market sensing (β=0.211; S.E=0.085; C.R=2.516; p-value= 0.012). The results demonstrate that the variable of entrepreneural orientation is capable of positively improving organizational learning and market sensing. This means that the higher the entrepreneurial orientation, the higher the market sensing. Thus, the first two hypotheses (Hypothesis 1& 2) are accepted (Table 5). Note: EO=Entrepreneurial Orientation; RF=Marketing Resource Flexibility; OL=Organizational Learning; MS=Market Sensing; MP=Marketing Performance. However, the testing result of the effect of entrepreneurial orientation on company performance shows insignificant relationship (β=0.063; S.E=0.080; C.R=0.730; p-value=0.465). Therefore, hypothesis 3 is rejected. The statistical testings of the influence of resource flexibility on market sensing (β=0.150; S.E=0.064; C.R=2.243; p-value=0.025); and on marketing performance (β=0.312; S.E=0.069; C.R=4.267; p-value=0.01) show positive significant relationships. These results indicate that hypotheses 4 & 5, mentioning a positive significant influence of resource flexibility on both market sensing and marketing performance, are supported. Resource flexibility measured by some dimensions of utilization, allocation, reallocation and adoption is of positive and significant impact on market sensing. Thus, flexible resource management is very helpful in entrepreneurial management in meeting the needs of customers and understanding customer values. The testing shows that organizational learning significantly influences market sensing (β=0.366; S.E=0.082; C.R=4.530; p-value=0.01). This means that the hypothesis stating that organizational learning is of positive and significant effect on market sensing is supported (hypothesis 6). Finally, the testing reveals a significant positive influence of market sensing on marketing performance (β=0.343; S.E=0.078; C.R=4.337; p-value=0.01), meaning that the higher the value anticipation, the higher the marketing performance. Thus, hypothesis 7 mentioning a positive influence of value anticipation on marketing performance is supported (Figure 2). Generally, the study reveals that market sensing as a mediating variable is a valuable antecedent in fulfilling the theoretical gap in the relationship between entrepreneurial orientation and marketing performance. Futhermore, the findings are actually useful in analyzing entrepreneur management in anticipating the customer trends, particularly of the budget hotels in Bali that highly contribute to support the excellent performance and continuity of tourism in this region as one of the world’s most popular destinations. This means that market sensing is able to demonstrate its role in improving the performance of budget hotels that implement the strategy of entrepreneurial orientation. In practical terms, the testing results have implications for the two alternative strategies in improving the performance of budget hotels. Firstly, the performance of budget hotels that implement the entrepreneurial strategy can be enhanced by improving the integrated business anticipation. Secondly, budget hotels which have the ability in implementing preemptive and proactive actions, and in being responsive to the demands and needs of customers are more likely to improve the hotels’ capability to provide services in accordance with, or even exceed, their expectations. These strategies will ultimately increase customer revisit intentions and maintain their loyalty. Finally, the findings show that entrepreneurial. Alegre, J., & R. Chiva (2009). Entrepreneurial orientation, organizational learning capability and performance in the ceramics tyles industry. Working Paper. Awang, A., Asghar, A.R.S., & Subari, K.A. (2010). Study of distinctive capabilities and entrepreneurial orientation on return on sales among SMEs in malaysia. International Business Research, 3(2), 34-48. Blocker, C.P. (2007). Exploring the role of customer value change and relationship adaptation in global business services. Unpublished Doctoral Dissertation, University of Tennessee. Budiharseno, R.S. (2017). Factors affecting online buying behavior on g-market site among international students in Busan: A qualitative research. Arthatama: Journal of Business Management and Accounting, 1(1), 1-5. Celuch, K., Murphy, G.B., & Callaway, S.K. (2007). More bang for your buck: Small firms and the importance of aligned information technology capabilities and strategic flexibility. The Journal of High Technology Management Research, 17(2), 187-197. Cohen, W.M., & Levinthal, D.A. (1990). Absorptive capacity: A new perspective on learning and innovation. Administrative Science Quarterly, 35(1), 128-152. Covin, J.G., & Slevin, D.P. (1989). Strategic management of small firm in hostile and benign environments. Strategic Management Journal, 10, 75-87. Eggers, F., Kraus, S., Hughes, M., Laraway, S., & Snycerski, S. (2013). Implications of customer and entrepreneurial orientations for sme growth. Management Decision, 51(3), 524-546. Eriksson, T., Nummela, N., & Saarenketo, S. (2014). Dynamic capability in a small global factory. International Business Review, 23(1), 169-180. Esturilho, C.G., & Estorilio, C. (2010). The deployment of manufacturing flexibility as a function of company strategy. Journal of Manufacturing Technology Management, 21(8), 971-989. Ferdinand, A.T., & Batu, K.L. (2013). MAIsCap-marketing architectural isolating capability as antecedents for success of new product development. Journal of Economics, Business, and Accountancy Ventura, 16(3), 487-502. Flint, D.J., Blocker, C.P., & Boutin, P. (2008). Customer value anticipation as an operant resource driving customer satisfaction and loyalty. Otago Forun 2. Gebauer, H. (2011). Exploring the contribution of management innovation to the evolution of dynamic capabilities. Industrial Marketing Management 40, 1238-1250. Gindy, N.N., & Saad, S.M. (1998). Flexibility and responsiveness of machining environments. Integrated Manufacturing Systems, 9(4), 218-227. Grande, J., Madsen, E.L., & Borch, O.J. (2011). The relationship between resources, entrepreneurial orientation and performance in farm-based ventures. Entrepreneurship & Regional Development, 23(4), 89-111. Hair, J.F., Black, W.C., Babin, B.J., & Anderson, R.E. (2010). Multivariate data analysis,(7th ed.). New Jersey: Pearson Prentice Hall. Hough, J.R., & White, M.A. (2004). Scanning actions and environmental dynamism: Gathering information for strategic decision making. Management Decision, 42(6), 781-793. Ismail, N.A. (2016). The roles of international entrepreneur orientation and geographical scope level to determine international performance: A case in the malaysian halal food industry. International Journal of Entrepreneurship, 20, 129. Jantunen, A (2005). Knowledge-processing capabilities and innovative performance: An empirical study. European Journal of Innovation Management, 8(3), 336-349. Development of research instruments. International Journal of Management, 27(3), 448-460. Keh, H.T.,. Nguyen, T.T.M., & Ng, H.P. (2007). The effects of entrepreneurial orientation and marketing information on the performance of SMEs. Journal of Business Venturing, 22(4), 592-611. Kramarz, M., & Kramarz, W. (2014). The flexibility and specialization of resources-competitive strategies of materials decoupling points of a network supply chain of metallurgic products. Procedia-Social and Behavioral Sciences, 111, 741-750. Levinthal, D.A (1991). Organizational adaptation and environmental selection-interrelated process of change. Organization Science, 2(1), 140-145. Li, X (2009). Entrepreneurial competencies as entrepreneurial distinctive: An examination of competency approach in definining entrepreneurs. Master’s Thesis, Singapore Management Univerity. Lopez, S.P., Peon, J.M.M., & Ordas, C.J.V. (2005). Organizations learning as determining factor for business performance. The Learning Organizations, 12(3), 227-245. Lumpkin, G.T., & Dess, G.G. (1996). Clarrfying the entrepreneurial orientation construct and lingking it to performance. Academy of Management Review, 21(1), 135-172. Lyion, D.W., Lumpkin, G.T., & Dess, G.G. (2000). Enhancing entrepreneurial orientation research: Operationalizing and measuring a key strategic decision making process. Journal of Management, 26(5), 1055-1085. Nasution, H.N., Mavondo, F.T., Matanda, M.J., & Ndubisi, N.O. (2011). Entrepreneurship: Its relationship with market orientation and learning orientation and as antecedents to innovation and customer value. Industrial Marketing Management, 40(3), 336-345. Rauch, A., Wiklund, J., Lumpkin, G.T., & Frese, M. (2009). Entrepreneurial orientation and business performance: An assessment of past research and suggestions for the future. Entrepreneurship Theory and Practice, 33(3), 761-787. Rhee, J., Park T., & Lee, D.H. (2010). Drivers of innovativeness and performance for innovative SMEs in South Korea: Mediation of learning orientation. Technovation, 30, 65-75. Santos Vijande, M.L., López-Sánchez, J.Á., & Trespalacios, J.A. (2012). How organizational learning affects a firm's flexibility, competitive strategy and performance. Journal of Business Research, 65(8), 1079-1089. Sapienza, H.J., Autio, E., George, G., & Zahra, S.A. (2006). A capabilities perspective on the effects of early internationalization on firm survival and growth. Academy of Management Review, 31(4), 914-933. Schienstock, G. (2009). Organizational capabilities: Some reflection on the concept. IAREG Working Paper, 1(2), 1-27. Unger, J.M., & Homburg, B. (2006). Entrepreneurial success the role of human capital and learning. Giessen: Universität Gießen. Wang, C.L. (2008). Entrepreneurial orientation, learning orientation and firm performance. Entrepreneurship Theory and Practice, 32(4), 635-656. Wang, Y., Zeng, D., Benedetto, G.A.D., & Song, M. (2013). Environmental determinants of responsive and proactive market orientations. Journal of Business & Industrial Marketing, 28(7), 565-576. Wiklund, J. (1999). The sustainability of entrepreneurial orientation-performace relationship entrepreneurship theory and practice. Entrepreneurship Theory and Practice, 24, 37-48. Wiklund, J., & Shepherd, D. (2005). 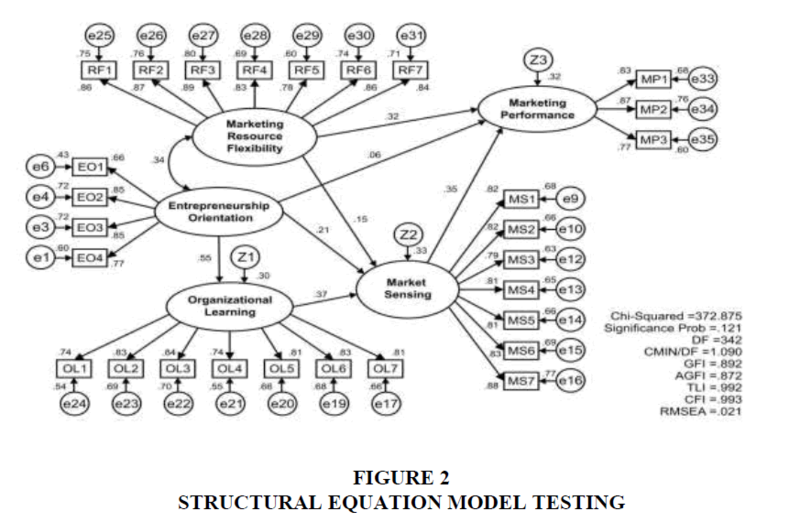 Entrepreneurial orientation and small business performance: A configurational approach. Journal of Business Venturing, 20(1), 71-91. Yang, C.W. (2008). The relationships among leadership styles, entrepreneurial orientation and business performance. Managing Global Transitions, 6(3), 257-275.